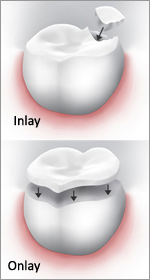 Inlays and onlays use the existing tooth as a base and fit the onlay onto the tooth. This procedure is done to strengthen the tooth, restore shape, and prevent further damage. An inlay is done when the damage to the tooth is a little more extensive. An onlay is done to replace the cusp of the tooth. Crowns are onlays which completely cover all surfaces of a tooth. These are produced at the Laboratory if they will be made out of porcelain.